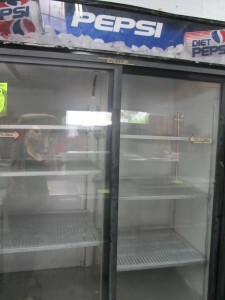 1, 2 and 3 door commercial coolers with glass and stainless steel doors. 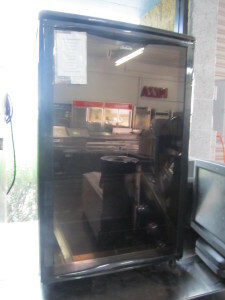 This attractive black True GDM-5 5 cubic foot countertop glass door merchandiser refrigerator will effortlessly increase impulse sales of your tempting grab and go sandwiches, salads, cold drinks, and more. It features two adjustable heavy duty PVC coated shelves for maximum merchandising flexibility. 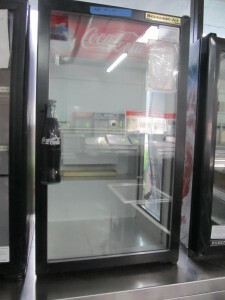 The countertop merchandiser refrigerator’s “Low-E” double pane thermal glass door combines with its oversized CFC-free 134A refrigeration system and 1/6 hp compressor to maintain a cabinet temperature of 33 to 38 degrees Fahrenheit. Foamed-in-place “Ecomate” insulation contributes to excellent thermal retention and energy efficiency. 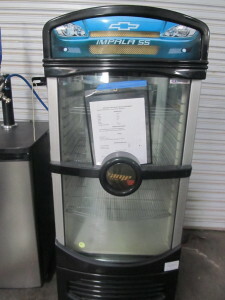 The exterior of this 5 cubic foot glass door merchandising countertop refrigerator is durable and easy to clean laminated vinyl. The interior is NSF approved, white, vinyl-coated aluminum with a 300 series stainless steel floor. 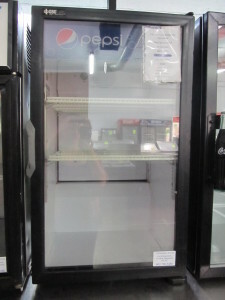 The True GDM-5-LD countertop glass door merchandiser refrigerator requires a 115V electrical connection, and is CE, UL, and NSF Listed. 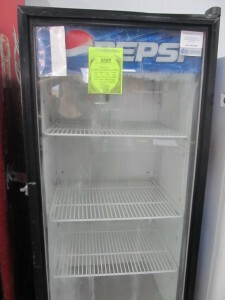 Keep your bottled beverages and other perishable products chilled while on display! This counter-top merchandiser will effectively increases impulse buys by maximizing space and offering superior product visibility. – Interior fluorescent lighting that makes your products shine! Made by the world’s #1 manufacturer of glass door merchandisers, this glass door merchandiser will maximize impulse sales for many years to come. Entire cabinet structure is foamedin-place using Ecomate. A high density, polyurethane insulation that has zero ozone depletion potential (ODP) and zero global warming potential (GWP). This glass door merchandiser by True uses a bottom mounted condenser to maximize energy efficiency by operating close to the ground, which is typically the coolest place in the kitchen. The two low-e doors provide superior temperature retention with two panes of thermal glass with a metallic oxide film to filter out UV radiation. Between the panes of glass is a layer of argon gas, which furthers energy efficiency in the merchandiser because it is denser than oxygen. 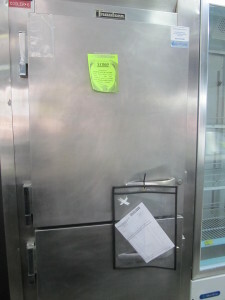 The merchandiser doors are counter balanced and self-closing for smooth opening and closing and have a positive seal. 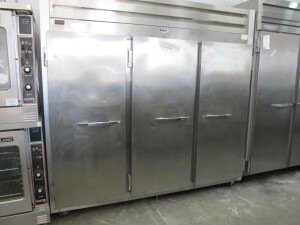 Anyone limited on space, yet still using a variety of cold and frozen foods, will benefit greatly from the dual-temp food holding capacities of the 30″ Solid Half-Door Dual Temperature Refrigerator/Freezer – from Traulsen. 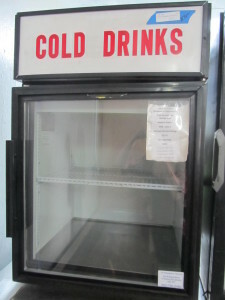 This reach-in, dual-temp cabinet is constructed from top quality components including a balanced refrigeration system, microprocessor controls and stainless steel resulting in a durable unit designed for commercial kitchen use. 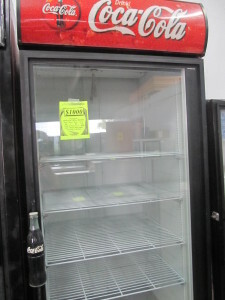 Limited Edition, Amp energy drink refrigerator. Store cans or bottles in this awesome display case. 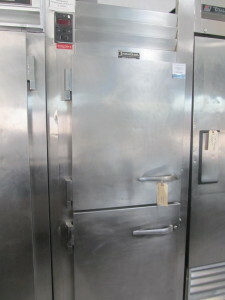 2 door, single compartment, over and under design with solid doors.